Hair Boutique is proud to be an Olaplex salon. 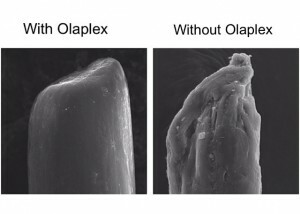 So what exactly is Olaplex? 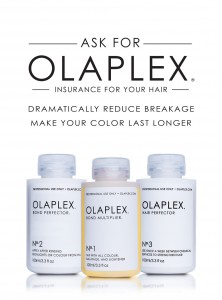 Olaplex is an amazing series of three products that works to repair and prevent damage to your hair that occurs during the colouring process. It is not a conditioner that will just coat the hair, there is nothing else like it, it has completely revolutionized hair care. Its a safe, non toxic product created by two chemists that actually works with the chemistry of the hair. The only way to deposit colour or lighten hair is by breaking the bonds that hold in your natural colour. The lighter you go the more destructive the process can be. The Olaplex treatment actually links these bonds back together, rebuilding hair and making it stronger and healthier no matter how light you go or how often you colour. This new colour service upgrade is a three part system that starts with the bond multiplier which is mixed directly into your colour. then the bond Perfecter is applied before the shampooing. Last, there is a take home treatment, the Home Hair Perfecter that you can use once a week along with your favorite shampoo and conditioner to continuously strengthen hair and extend the life of your colour. This process will mkae a huge difference in the health and appearance of your hair and is available in Hair Boutique today.